The FMC-200 is the industry’s first FPGA Mezzanine Card (VITA 57.1) providing a high performance Camera Link compliant connection. The FMC-200 is capable of capturing video from base, medium, full or extended mode cameras and is ideally suited to industrial, defense and aerospace applications. 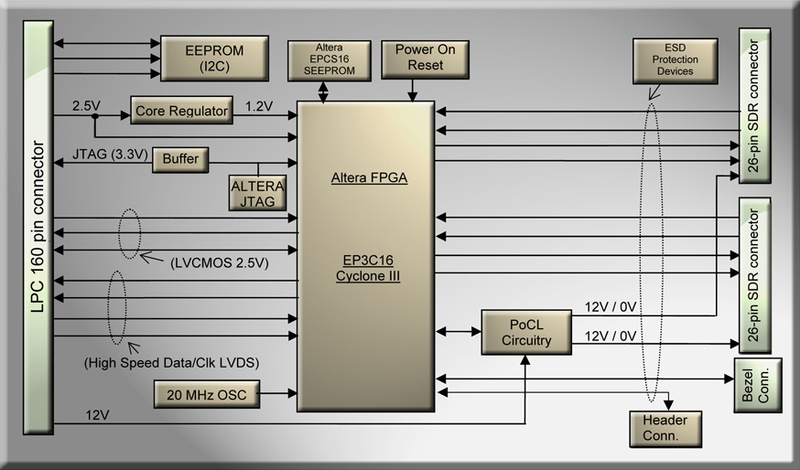 Customer specific data pre-processing or custom protocols are easily accommodated via the on-board Altera Cyclone® III FPGA. Provides switchable SafePower PoCL, supporting both conventional and PoCL Camera Link cameras. The FMC-200 also provides programmable external LVCMOS/Differential input and output signals for event synchronization.